Many trading strategies are based on a process, not a single signal. This process often involves a series of steps that ultimately lead to a signal. 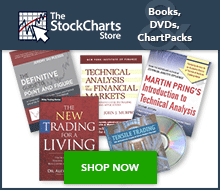 Typically, chartists first establish a trading bias or long-term perspective. Second, chartists wait for pullbacks or bounces that will improve the risk-reward ratio. Third, chartists look for a reversal that indicates a subsequent upturn or downturn in price. The strategy put forth here uses moving average to define the trend, the Stochastic Oscillator to identify corrections within that trend and the MACD-Histogram to signal short-term reversals. It is a complete strategy based on a three-step process. Moving averages are trend-following indicators that lag price. This means the actual trend changes before the moving averages generate a signal. Many traders are turned off by this lag, but this does not make them totally ineffective. Moving averages smooth prices and provide chartists with a cleaner price plot, which makes it easier to identify the general trend. This strategy employs two moving averages to define the trading bias. The bias is bullish when the shorter-moving average moves above the longer moving average. The bias is bearish when the shorter-moving average moves below the longer moving average. While chartists can use any combination of moving averages, this article uses the 20-day SMA and the 150-day SMA. The example below shows Baxter International (BAX) moving from a bullish trading bias to a bearish trading bias as the 20-day SMA moved below the 150-day SMA in mid-August. The second part of this trading strategy uses the Stochastic Oscillator to identify correction. As a bound oscillator that fluctuations between 0 and 100, the Stochastic Oscillator is ideal for spotting short-term pullbacks or bounces. A move below 20 signals a pullback in prices, while a move above 80 signals a bounce in prices. The third part of this trading strategy uses the MACD-Histogram to identify upturns and downturns in prices. The MACD-Histogram measures the difference between MACD and its signal line. The indicator is positive when MACD is above its signal line and negative when MACD is below its signal line. The MACD-Histogram turns positive when prices turn up, and turns negative when prices turn down. 1. Moving averages show a bullish trading bias, with the 20-day SMA trading above the 150-day SMA. 2. Stochastic Oscillator moves below 20 to signal a pullback. 3. MACD-Histogram moves into positive territory to signal an upturn after the pullback. The example above shows Polo Ralph Lauren (RL) with a few buy signals. First, notice that the 20-day SMA is above the 150-day SMA to establish a bullish trading bias. Second, the Stochastic Oscillator declined below 20 to indicate a price pullback and favorable risk-reward ratio. Chartists then turn to the MACD-Histogram to signal an end to the pullback with a move into positive territory. Notice that the MACD-Histogram is almost always in negative territory when the Stochastic Oscillator moves below 20. Sometimes this indicator stays negative for another week or two, so it's important to wait for confirmation of an upturn. 1. Moving averages show a bearish trading bias, with the 20-day SMA trading below the 150-day SMA. 2. Stochastic Oscillator moves above 80 to signal a bounce. 3. MACD-Histogram moves into negative territory to signal a downturn after the bounce. The example above shows Flour Corp (FLR) with a few sell signals. First, the trading bias turned bearish when the 20-day SMA moved below the 150-day SMA in June. Second, the Stochastic Oscillator moved above 80 several times as prices bounced within the downtrend. A move above 80 is just an alert to watch the MACD-Histogram closely. Acting on a move above 80 can result in a losing trade because it can sometimes take a week or two for prices to turn back down. The third and final signal occurs when the MACD-Histogram turns negative. The example below shows United Parcel Service (UPS) with six signals over a 12-month period. This is not the most ideal example, but it does provide some insights into real-world trading, which is often not ideal. There were four different trading biases on this chart. The yellow areas mark two periods with a bearish trading bias and two periods with a bullish trading bias. Bearish signals are ignored when the bias is bullish. Bullish signals are ignored when the bias is bearish. After the Stochastic Oscillator signaled pullbacks in March and April, the MACD-Histogram turned positive to trigger two bullish signals (1 and 2). These did not last long or work out well because trading was quite choppy. The thin blue lines mark support levels that could have been used for initial stops. A bearish bias started in June, with a bearish signal in mid-July (3) occurring just before the bias switched to bullish. This was a tricky signal, but chartists setting a stop-loss at resistance would have remained in the position and caught the big decline. After a couple more whipsaws (4 and 5), the strategy triggered a nice bullish signal in early December. With four indicators, there are lots of different ways to tweak this strategy. Chartists can adjust the moving averages to redefine the trend. Instead of the 20-day and 150-day SMAs, chartists could lengthen the timeframe for an even longer perspective on trend. Alternatively, chartists could use one long-term moving average, comparing it against the actual prices to identify the trend identification. The oscillators can be shortened to increase sensitivity or lengthened to decrease sensitivity. A 10-day Stochastic Oscillator would become overbought/oversold more often than a 20-day Stochastic Oscillator. Similarly, the MACD-Histogram (5,30,9) would cross the zero line more often than the MACD-Histogram used with the default settings (12,26,9). The decision to increase or decrease sensitivity rests with the characteristics of the underlying security. Stocks with lower volatility, such as those in the utilities and consumer staples sectors, would warrant more sensitive settings. Stocks with higher volatility, such as those in the technology and biotech sectors, may warrant less sensitive settings. The trick is to find the setting that produces enough signals, but not too many. This “Moving Momentum” strategy provides charts with a means to trade in the direction of the bigger trend. Moreover, this strategy is designed to identify lower risk and higher reward opportunities by waiting for corrections. The moving average sets the tone, bullish or bearish. The Stochastic Oscillator is used to identify pullbacks within bigger uptrends and bounces within bigger downtrends. The MACD-Histogram is used to signal the end of a pullback or bounce. Keep in mind that this article is designed as a starting point for trading system development. Use these ideas to augment your trading style, risk-reward preferences and personal judgments. Click here for a chart of IBM with the 20-day SMA, 150-day SMA, Stochastic Oscillator and MACD-Histogram.